…and Ft. Motte to the World! Applause broke out the Sunday morning when it was announced that Ajay* had become a Christian. 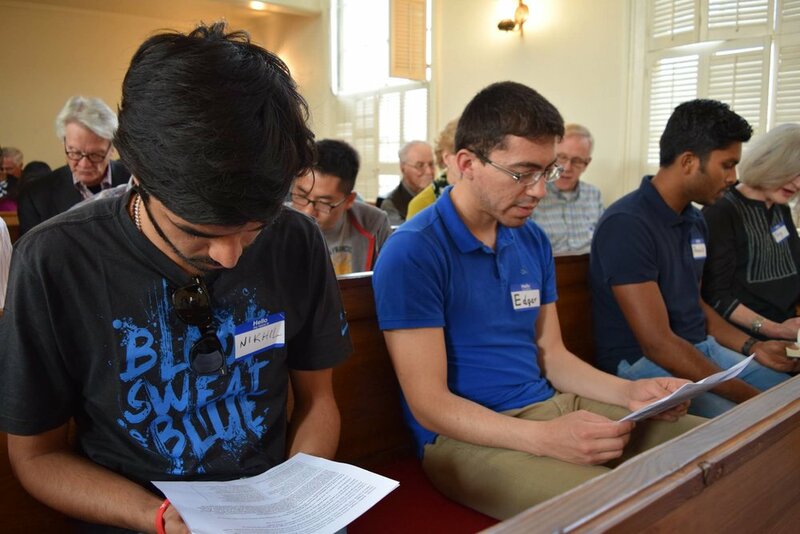 Ajay is just one of over one million foreign students that study in the U.S., and one of over 50 students who visited St. Matthew’s Parish, Ft. Motte, SC as part of our International Student Weekends. He opened his heart to Jesus after our church family opened their hearts, lives, homes, and church doors to him. BUT, what were students from China, India, Saudi Arabia, Taiwan, Brazil, Japan, and Russia doing in the “mythical village” of Ft. Motte? How did a church in the middle of a cotton field launch a ministry that is having a global impact? It wasn’t in our plan, but the way things came together I have to believe it was in God’s plan. After teaching and leading various mission courses and having guest missionary speakers at our church, God began to prepare our hearts and minds for a new part we are to play in His Great Commission. At the same time, God was moving on the hearts of Francis (our Finance Chairman) and Nina (our Sr. Warden) to open their beautiful farm and guest cottage to be used for mission. God was also stirring something new in me. I had reconnected with old friends, Lisa and Leiton Chinn, at the New Wineskins for Global Mission Conference in April 2016 in the Chinn’s Re-entry workshop and invited them to meet with our church leadership and see where God would lead us together. At the end of our lunch, in true Walter Hannum-style, Leiton challenged us to explore the opportunity of opening our homes to international students. Within 90 days we had our first International Student Weekend with students from the University of South Carolina and Benedict College, and a second weekend followed in the spring with students from the University of North Carolina-Charlotte. On these weekends, students and church members enjoyed fishing, canoeing, air plane rides, garden tours, hay rides, a cookout, and a barn dance with shag lessons. On Sunday, we used instructed Morning Prayer where the Gospel was presented and we closed with a home-cooked-full-on-Southern Sunday fried chicken dinner in the Parish Hall. With the exception of having The Rev. John Burwell, our DJ, and Lisa Chinn, our weekend speaker, everything was sourced from the talents and resources of our church family. Sleeping in an American home, seeing how real American families live, and even stepping foot in a church were first-time experiences for many of these international students. So why open the doors of our lives, homes, and churches to International Students? We open the doors so that God’s glory will be made known among the nations (Psalm 96:3). Imagine the opportunity to reach countries that are closed to the Gospel, or are restrictive towards missionary efforts! The three leading countries sending international students to the U.S. represent the three major religions in the world: Buddhism, Hinduism and Islam. Saudi Arabia and China lead the list with over 330,000 students in the U.S. We reach out to these students because God’s desire is to have international worshippers from every tribe, language, people and nation (Revelation 5:9). We bring delight to God when we obey his command to love our neighbors. God is thrilled when we love those He loves for He says He loves the foreigners in our midst (Deut. 10; Lev. 19). God is pleased and honored when we make disciples of all nations. Although many international students today may come from wealthy families, are mostly independent, technologically savvy, and continually connected through social media, they still need us! They need to experience our radical hospitality, our unconditional love. They love being part of our family. They need to see models of Christians in the workplace and at home. They will always remember a home-cooked meal. Unfortunately, a vast majority of them have never been invited to an American home! They need an intelligent conversation about the world and life in general, and what they need most is to hear about Jesus in a prayerful, sensitive, and powerful way. Oh, how we need them! Our worldviews are in dire need of expansion and befriending internationals will do just that! We need Christian international students with a vibrant faith and passion for the Gospel enough to even impact our clergy. International student converts from other faiths can teach us more about the cost of following Jesus. Their suffering and commitment put us to shame for the petty things we complain about! How do you start doing International Student Ministry? Pray and reach out. Pray that your eyes and the eyes of the people in your church will be opened to see the “world at your doorstep," to see the “Samaritans in your midst,” and to see the unique resources and talents God has already placed in your faith community that can be brought to bear in ministering to internationals. To borrow an adage or two from “Experiencing God”, ask yourself, “what’s in our hand?” and then ask, “where is God moving and how can we get on board?” Reach out to your local college or university and see who is doing work with internationals and ask how you can get involved. Over half of the churches in the Diocese of South Carolina, for example, have colleges less than 30 minutes away. Small budget? Small church? No problem! Mobilizing your church for mission doesn’t USE resources, it RELEASES resources! You and your church will get infinitely more out of it than you put in! International Student Ministry will not drain your church; it will energize it! And as far as being SMALL, well, remember that God loves to use the small to do GREAT big things! You can be involved here and now: no passport, no visa, no immunizations, no learning another language! You don’t even have to leave home. And thank God for that, because our folks love Ft. Motte! *We are not using the student’s real name for security reasons. The Rev. Janet Roberts Echols is the Rector of St. Matthew’s Episcopal Church. She is a graduate of Trinity School for Ministry and has served in churches in South Carolina, Pittsburgh, England, Indonesia, and India. She and her husband, The Rev. Dr. Charles Echols, served with AFM in India. God’s call on her life is “to mobilize the church for mission” but her best and greatest job is being mom to one really amazing kid, Grace Carolina. How To Take the Assembly Home: Four Next Steps that Won't Weigh You Down!